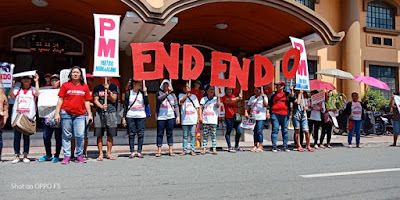 The Department of Trade and Industry (DTI) should impose its weight against rising inflation rather than keeping the labor price low under the policy of contractualization. The DTI has always been on the side of business, thus, when Secretary Ramon Lopez stated that contractualization “is not unfair to workers” he was essentially parroting the line of the Employers Confederation of the Philippines (ECOP) whose bottom line position on this issue is to keep the price of labor low to remain competitive. For DTI and ECOP, the best way to keep the price tag of labor low is to keep contractualization as the prevailing policy of the Duterte administration. The labor movement has repeatedly rejected the “win-win” formula of DTI and the Department of Labor and Employment (DOLE). Our bottom line is change: Direct hiring must be the new policy. This is the only way workers can actually enjoy their constitutional right to security of tenure. The DTI and DOLE position is for workers to enjoy security of tenure in their respective manning agencies and not in their principal employers as contained under Department Order 174 of DOLE. This “win-win solution” has led to a farcical situation where majority of the more than 45,000 workers reportedly “regularized” under DO 174 last year now find themselves “regularly employed” by agencies and not by the principal. The rule should be, as its name denotes, manpower agencies and other service providers should merely be treated as agents of the principals. This is the main reason why we have been pushing for an Executive Order to correct this distortion and rectify decades of injustice imposed upon millions of workers. The Labor Secretary, and in this particular case, the President, can prohibit contractualizaton under the Labor Code. Contractualization under the proposed EO is still recognized. Only that the types of job that can be contracted out be done upon consultation with members of the National Tripartite Industrial Peace Council (NTIPC). What the DTI wants is to perpetuate the norm of contracting out almost all jobs in the guise of management’s exercise of their prerogative. This regime, for over two decades, led to a dramatic change in employment relations, with “middlemen employers” such as manning agencies and “labor cooperatives” dominating the trade. This norm also has dissipated almost all rights guaranteed to workers by the constitution and labor laws, from security of tenure, right to organize, collectively bargain and to strike in accordance with law, and to be represented in the formulation of policies affecting their welfare. Again, to DTI: Contractualization is not unfair to workers? It seems like this agency is now headed by a feudal lord. Trading workers through manpower agencies who act as middlemen in a trilateral employment relationship is feudalism, which is clearly unjust. For more than two decades, this re-feudalization of labor has become the norm and keeping the policy will perpetuate this abominable condition of poverty and inequality amid economic growth. Hence, when we stated that the buck stops now with the President, it is because we believe the impasse can be resolve in favor of justice. It’s either change as promised by the President, or business-as-usual as demanded by ECOP.